The home of cassoulet prides itself on excellent food. The Languedoc region covers a large amount of territory, and within that there are many different culinary specialties. 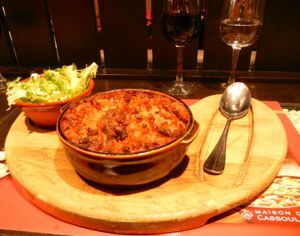 Perhaps best known is cassoulet, the hearty bean-duck-pork stew said to have been invented in Castelnaudary. The Maison du Cassoulet, a restaurant in the region, kindly provides a recipe on their menu. Ingredients include white beans, confit de canard or d'oie (duck or goose preserved in fat), sausage, and several kinds of pork. It's definitley a cold-weather, stick-to-your-ribs meal—and delicious. Other duck and goose dishes, particularly confit de canard, will be commonly found on local menus. And you will also find a great selection of olives. The region also produces numerous cheeses, including some fine brebis, or sheep's milk cheeses, and goat cheeses. Roquefort originated in the north of this region, and you'll find plenty of it in Languedoc. Along the coast, near Narbonne and Perpignan and north toward Montpelier, of course you will find seafood specialties. A fish stew called Bourride, served with a garlicy mayonaise, is a specialty on the northern coast. And of course there is local wine. Less known than regions such as Bordeaux or Burgundy, the Languedoc nonetheless produces excellent wines, often at lower prices than the better-known ones. Eating and drinking the local specialties is a great way to learn about the different regions of France. We strongly recommend it! Above, A piping hot bowl of cassoulet, served with a salad and a glass of local red wine. Yum!